Located by the banks of the picturesque Loch Rannoch lies Loch Rannoch Highland Club. 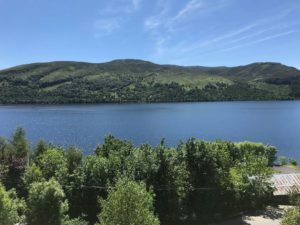 A selection of lodges and apartments with breathtaking views of one of the most beautiful Lochs in Highland Perthshire. 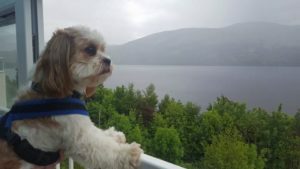 Baxter, Laurie and I have recently returned from a wonderful, relaxing break at Loch Rannoch Highland Club. We stayed in Highland Lodge 6 which is one of the larger lodges, with 3 bedrooms comfortably sleeping 6 people. The bedrooms are on the lower level with upstairs having a large open plan living room, dining and kitchen area with a conservatory that has a Juliet balcony. We even had the added bonus of a sauna/steam room and an outside decking area that you could access from our bedroom through double doors. Baxter loved sitting out here making the most of the sunshine! The views from the conservatory and balcony are some of the best I’ve seen in Perthshire. You can see Schiehallion, one of Perthshire’s Munros, the calm and tranquil water of Loch Rannoch and the beautiful hills and woodland walks that are perfect for exploring with your dog. As soon as we arrived Baxter plonked himself in front on the balcony and was admiring the views just as much as us! The lodges and apartments are self catering and come fully equipped with everything you would need to cook a meal. 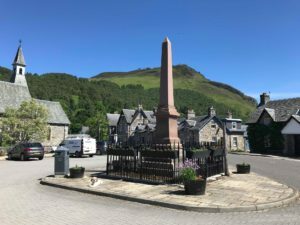 In Kinloch Rannoch which is only a short walk from the accommodation you will find the local shop where you can stock up on essentials if need be. If you want to eat out with your dog then you have that option too. The Riverbank Cafe in Kinloch Rannoch loves welcoming dogs. We visited a couple of times while we stayed and the food was delicious both times. I recommend trying the stalkers platter! You also have The Tearoom at Rannoch Station which is a wee bit of a drive away but well worth it. On the drive there you will be able to take in fully the beauty of Loch Rannoch and Rannoch Moor. There are some sandy beaches on the lochside which you will pass which is great for stopping off and letting your dog have a paddle. The Tearoom serves a great selection of home cooked meals, freshly made sandwiches and cakes. The perfect place to fuel up after a busy day of exploring and the staff always have a biscuit and bowl of water available for dogs. If you fancy a drink at night time then you have Loch Rannoch Hotel located only a minutes walk from the Highland Club. The reception and bar area welcomes dogs. We visited one night and it was lovely but being honest it was a bit on the pricey side. If you are wanting a night off from cooking then it’s perfect being so close by to where you are staying but the cost would soon add up if you did it often. You have everything you need to prepare a meal in the apartments and lodges and to be honest with the views from the dining room and conservatory we much preferred having dinner where we were staying. We all loved how tranquil the area is. I love being next to water, I find it very calming and soothing so having the views of Loch Rannoch from nearly everywhere in the lodge and it only being a couple of minutes walk down to the Loch shore was perfect. Baxter enjoys having a paddle too so the still Loch water for him was great. He spent most of his stay in and out the water! You have plenty of walks in the area also. For anyone that likes to do Munro Bagging there are 26 Munros in the recognised Loch Tay to Loch Rannoch region! Loch Rannoch Forest walk is a popular walk with locals and visitors to the area and is located on the south of Loch Rannoch. It’s well marked and easy going through woodland and a beautiful stream. Another enjoyable walk is the Riverside walk in Kinloch Rannoch. It takes about 30 mins and is a nice walk alongside the river and through a small wooded area. It’s a good one to do if like us you walk into Kinloch Rannoch to grab a bite to eat then head back to your accommodation. There are also guided walks so if you would like to find out more about the history of the area, native trees and wildlife then I would recommend doing it. Dogs are more than welcome to tag along too just please keep them on a lead. If you would like to find out more about the guided walks then please speak to the reception at Loch Rannoch Highland Club. The apartments and lodges can accommodate between 2 and 8 guests. They are tastefully decorated throughout but with a modern Scottish theme which is suited to the location. 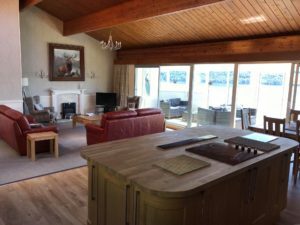 We would happily stay again by ourselves or with friends and family next time which I think we will do as the space in the larger of the lodges is perfect for a few of you holidaying together. 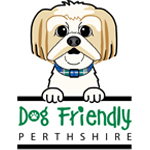 A big plus which will appeal to many dog owners is that the Highland Club happily allows you to have up to four dogs stay with you. You won’t find many accommodations that will allow that many dogs at no extra cost! 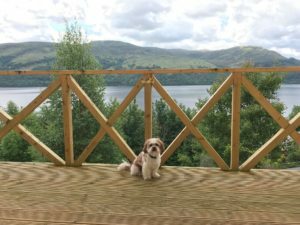 Loch Rannoch Highland Lodges are superb for a dog friendly holiday. You can’t beat the location. You feel miles away from anyone as it is so relaxing and tranquil. You are spoiled for choice with walks which are suited to all abilities and if you want to just sit by the Loch’s edge and take in the wonderful view like we did on the evenings you can do that too. It’s an ideal holiday for all the family, especially any four legged family members.